The label below is another from the fine collection of Montreal’s McCord Museum. Once again we see the term “stout porter”, which shows that the black roasty beer, porter, had different qualities. One way to express a strong, superior quality was to call porter, stout. Another, older term for the same thing was brown stout. J.W. Bridges doesn’t come to mind as one of the classic porter breweries of London. It wasn’t, it was a bottler and exporter of beer, based in London, as confirmed in The Encyclopedia of Ephemera by Maurice Rickards and Michael Twyman (Routledge, 2000, NY), specifically here. There are numerous references in commercial publications from New Zealand to California and beyond that Bridges’ beers were actively being exported through the world. 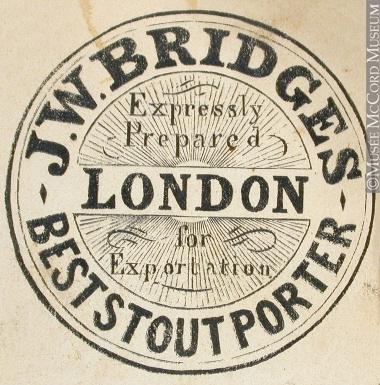 This company selected porter, stout and pale ale from its sources in England and used its own label to supply the goods. In the form we see above, it was a kind of contract brewing really, a practice very modern and one sees it too in the whiskey world, particularly in the United States. This is where the brewer is not identified on the label although the importer might have been told the source. Some of Bridges’ main suppliers were the high-quality Guinness and Bass concerns, as show in this 1901 advertisement from the New Zealand Daily Telegraph. I don’t know whose beer went into bottles for the label above, but would think they were reputed sources to get the name Bridges had around the English-speaking world. Bottling of beer was once a specialized business. People would buy beer in bulk and sometimes age it until the right conditions for bottling were achieved, and then bottle and sell the beer to its customers. Stout could be kept in cask nine months before bottling. Guinness used independent bottlers for much of its history until it finally took in the business after WW II. Dog’s Head was a famous bottler’s brand of Guinness, and there were many others. Different bottlers achieved their own reputations for stability in particular (beer not going sour or becoming infected), or the beer having other particular qualities. This fine collection of Guinness labels, from The International Society of Label Collectors & British Brewery Research, shows some of the many concerns which bottled Guinness at one time for the market. Some exported beer certainly was dosed with preservative in the days before pasteurization. The quality of much of the exported beer may be doubted and although I can’t find it readily, I recall reading a comment of a Victorian beer fancier who said no bottle of Bass Ale he had drunk on the Continent approached the same article back home. Still, a local market – one not familiar necessarily with home conditions – could easily form a particular taste, which may be at the origin of the famed India Pale Ale. Porter, Stout, What’s It About?